It’s time to start a new conversation about education for the children of the commonwealth. On June 18th, the 20th anniversary of the signing of the Education Reform Act of 1993, Strategies for Children began that conversation along with its partners the Massachusetts Budget and Policy Center (MassBudget) and the Massachusetts Business Alliance for Education (MBAE). 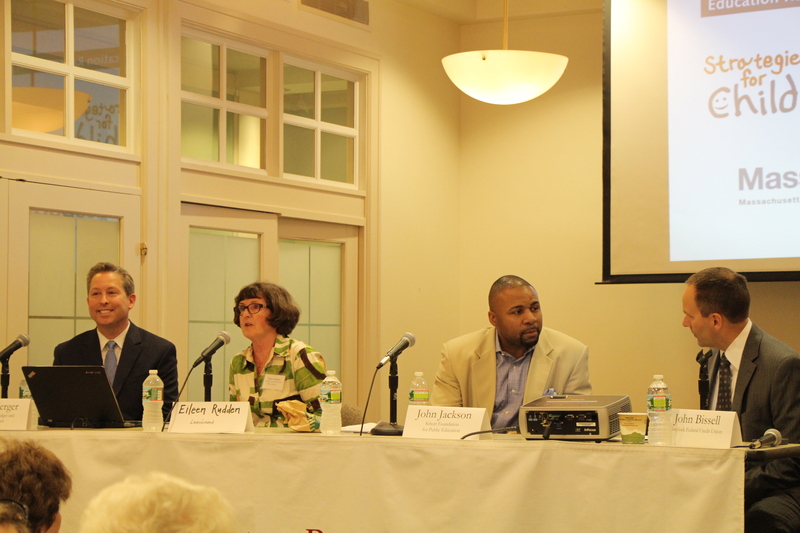 The three organizations hosted a panel discussion for nearly 100 attendees at the Boston Bar Association to reflect on how far the state has come and discuss the many opportunities that exist for making innovative and meaningful progress. The state’s work on education reform has made Massachusetts a national leader on standards-based reform – tied to increased funding – that has resulted in the commonwealth leading the way on many key educational benchmarks. Yet there are still significant, persistent achievement gaps. Schools aren’t meeting the needs of all of our children. And too many students fail to complete high school and college. Meanwhile, the world has changed dramatically over the last two decades, compelling Massachusetts to develop new, innovative ways to bring educational excellence into all our classrooms. To tackle these issues, the panelists in our discussion called on the state to invest in early education; to reach out to more children, especially those who are struggling to achieve; to look at how technology can improve learning; and to prepare children to succeed in a high-tech economy. The conversation was kicked off by Carolyn Lyons, president and CEO of Strategies for Children, and Representative Alice Peisch (D-Wellesley), co-chair of the Legislature’s Joint Committee on Education, who highlighted the need to ensure our children have access to high-quality early education, among other policy priorities. Moderator Linda Noonan, the executive director of MBAE, asked the four panel members to comment on how the state brought about education reform and how it can make dynamic progress moving forward. Here are highlights of what they said. “There is no such thing as a poorly educated state with a strong, high-wage economy,” Berger said. He pointed out that in 1979 a high school diploma was enough to help people get a good job. Today, higher incomes tend to go to those who earn higher education degrees. We have to look at what we’re not doing, Berger said, pointing to examples such as increasing learning time and providing more mental health services. “This is not the kind of EKG that you have in a thriving economy,” Bissell said, pointing to a slide showing that third grade reading levels have been stagnant for more than a decade. Bissell is the co-chair of Pittsfield Promise, a coalition of community leaders that has a goal of getting 90 percent of third graders in Pittsfield to read at grade level by 2020. Bissell is a passionate supporter of early education, arguing that these programs are essential for children and essential, in the long term, for supplying businesses with workers and for supplying cities like Pittsfield with more economic prosperity. For Bissell, it’s an economic development issue. “We’re trying to make sure that when my kids graduate, it’s at least an option to come home,” he said, instead of going to a wealthier city where there are more opportunities – an economic concern shared by many in the commonwealth’s Gateway Cities. Consider the job of bank teller, Bissell said. It used to be an entry-level position. Today, however, tellers have to be familiar with rules and regulations that have grown more complex, especially since 9/11. They also have to be able to use 15 kinds of software, master 54 procedures, and manage the $25,000 in their drawers. Unfortunately, Bissell noted, more and more candidates aren’t equipped to do this job. Bissell said he spoke to a principal who told him that disadvantaged children can catch up by kindergarten if they get home visiting services and then enroll in high-quality preschool programs. But instead of making this investment, Bissell noted, Massachusetts has cut funding for early education by 29 percent since 2001. This isn’t creating the “sense of urgency” that the state needs. “We have an opportunity gap that’s much broader than the achievement gap,” Jackson said. Among the hardest hit by the opportunity gap are African-American and Hispanic males. Massachusetts should also depopulate its prisons as a fiscal mechanism to free up money spent on incarceration so that these funds can be used for other things such as education. “The broader issue is poverty,” Jackson said. “As we look into the next 20 years of education reform this is one of the tools we have to solve the achievement gap,” Rudden said of technology. Massachusetts has led on NAEP scores (National Assessment of Educational Progress), Rudden said; but other states are beating us when it comes to technological innovations and on reimagining what schools could be. Rudden pointed to Lexia, a Concord, MA, company that sold a technology-based reading program to Kansas to improve that state’s K-5 reading outcomes. California just held a “Startup Weekend” on “NextGen Schools,” an event where educators, designers, funders and others gathered to discuss a new school model that would, according to the event website, radically transform traditional approaches to learning. Rudden called on Massachusetts to experiment with ways to close the achievement gap and promote academic success. “We have 200 start-ups working to create solutions” for education, Rudden argued. Technology, she said, can help teachers in classrooms where students’ skill sets span four different grade levels. So we no longer have to tell teachers to deal with differential learning challenges without providing guidance or tools. After a spirited question and answer session between the panel and audience members, Carolyn Lyons ended the session by thanking the panelists for starting a conversation that we hope will echo broadly. Massachusetts faces competition from other states as well as other nations. And now, 20 years out from Ed Reform, the commonwealth has the chance to invest in a new era of unheralded educational innovations.